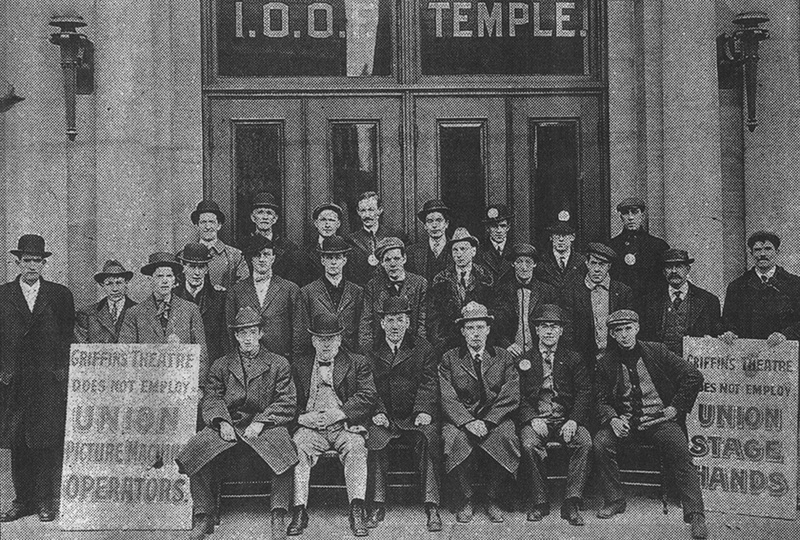 IATSE Local 129 was chartered in 1906 in Hamilton, Ontario. At the time, because of it’s location between Buffalo and Toronto, Hamilton was an entertainment hotspot. A stop on all Vaudeville circuits, all the big names stopped here, and we had the Theatres to put them in. At it’s height there were 21 performing arts spaces in Hamilton, including the Lyric, the Temple, The Grand Opera House, the Palace, the Capitol, and many more. Our technicians worked them all. From the original 18 members, we are now 200 strong. We have expanded beyond the Theatres and now represent the folks who build the scenery at our shops, and the folks who bring us fireworks and laser shows. We put up the Concerts at the Arena and Stadium, we dress the dancers at Hamilton Place, we build the sets and costumes at Theatre Aquarius. We light the stage at the Sanderson, and be sure the singers are heard. WE cover ALL aspects of live entertainment. For 110 years we and our families have been a part of the community of Hamilton, and we take that very seriously. We are proud to be in the Hammer. We participate in the food banks Everyplateful Challenge every year with donations going to local food banks, we enter teams in the Ride for Heart, we provide financial assistance organizations such as The Hamilton Philharmonic, The Workers Arts and Heritage Centre, Thrive and the Good Sheppard. Each year we sponsor a bursary for a student at the Ontario Sears drama Festival. We encourage our members do outreach to schools and organizations through a sense of union, not just amongst ourselves but with our community.